The drones have taken up the Gen z by storm, the recent release about the new ones has been the talk of the town! Let's see what they're up to and how different they're from each other. First, even if they are alike in portability, the latter has built-in Camera, the former is designed to work with several GoPRO cameras. Given that, both of these multi-rotors are portable, but how portable are they? The Mavic has the edge! Both of them use a folding design to make them easy to carry around, but Mavic is lighter and folds down as small as a bottle of water! Most importantly flight specs, Karma tops out at 35 mph with a range of 1km and altitude of 4,500 m. Mavic is far more. 40 mph, 7km range and 5000m ABOVE THE SEA LEVEL. Elsewhere, the Karma features some safety features such as built-in no-fly zones and a return-to-home button. One feature it doesn't come with, however, is obstacle detection, something which DJI has included on the Mavic Pro. Further more, DJI's drone is capable of following you around, hovering above your position as you move, nothing like GoPRO's. Controlling these beasts? The Karma comes with its own controller, which looks outdated. It has a 5" touchscreen in 720p resolution. But DJI has better options, controlling it using just your smartphone if you want. GoPRO has announced the GoPRO passenger app, which let's to view and control the camera but you'll not be able to actually control the Karma drone with a phone app. As an advantage, it offers a pair of goggles that look much like a VR headset and allows you to see what that camera sees. The Karma will be for £720 from Oct 23 which is great deal when compared to Mavic's £1000. However £720 doesn't include the camera, which you'll have to buy separately. 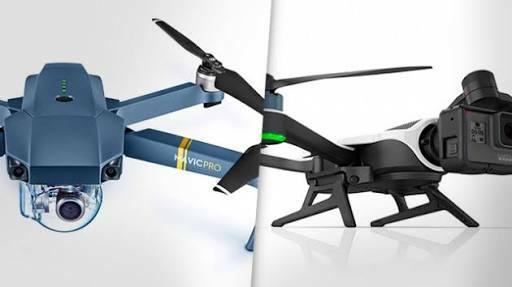 It's impossible to call a clear winner, as we're yet to test out both drones. But it's more likely to be really close. It depends upon what you're looking for then, so. As it stands, it's disappointing to have good features spread across two!